Let me just say that we are a potato loving family! Throw on some cheese and it just gets better, right? But let’s stop and think how can we take steakhouse potatoes over the top! Why are theirs so scrumptious? Why do I put them in my mouth and close my eyes as if I just reached heaven? Just admit it! You know what I’m talking about. We have all done it! Steakhouse Potatoes with Melted Cheese – Ready to Eat! We always want to be able to make these at home, but no matter what we do, they just never seem to be quite as good. It’s like they are hiding a secret ingredient in the back and they aren’t telling us what it is! The truth is that there are a couple of trade secrets. We’ll break them down for you so you can make these delicious, to-die-for steakhouse potatoes at home! The type of cheese used is extremely important. Typically, we all stick to the popular, most readily-available cheeses in the grocery store. We can find a good cheddar and colby there. The real magic happens with the third cheese, smoked gouda. If you are going to cook these in the oven, use the smoked gouda. 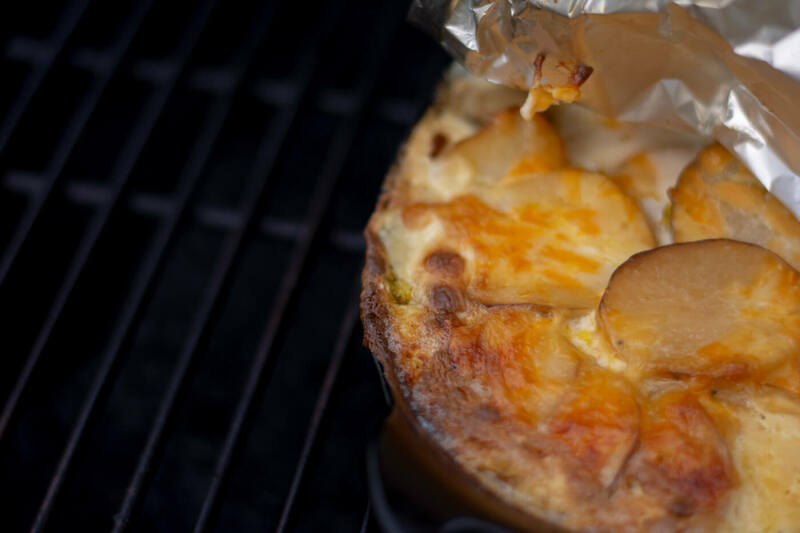 If you are going to grill them on a charcoal grill like the Big Green Egg, you may be ok to stay with a non-smoked gouda. Gouda is going to be found in the gourmet cheese section of the grocery store. You see those other cheeses that you buy for the holidays or Ina Garten uses in her awesome recipes? Yep, they are OVER THERE! Gouda is a soft cheese that is made from cow’s milk. 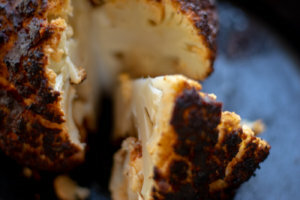 If you don’t find it, you could substitute Muenster or Jack, but don’t try to substitute cheddar or colby as they are semi-firm cheeses and it will really alter the taste of the steakhouse potatoes. We need to look at the science as well as the flavor here. The softer cheese is going to melt completely different than a semi firm or firm cheese. Quick Gouda fact: it comes from the Netherlands and consists of 50-60% of the cheese consumption worldwide! Stop and think about that. The other piece of magic in these potatoes is the use of heavy cream. Think about the different kinds of milk products you use for cooking and the richness each one offers. You know that the use of 2% milk is not the same as whole milk. Using heavy cream is taking it up several notches. I didn’t ever say this dish was a low calorie one, so stay with me here! Using a lighter cream or half and half will reduce the calories, but it will impact the taste. I know, I know……that didn’t help a whole lot, but it’s an option. If you use a less-rich milk product, you will lose the richness of the dish. 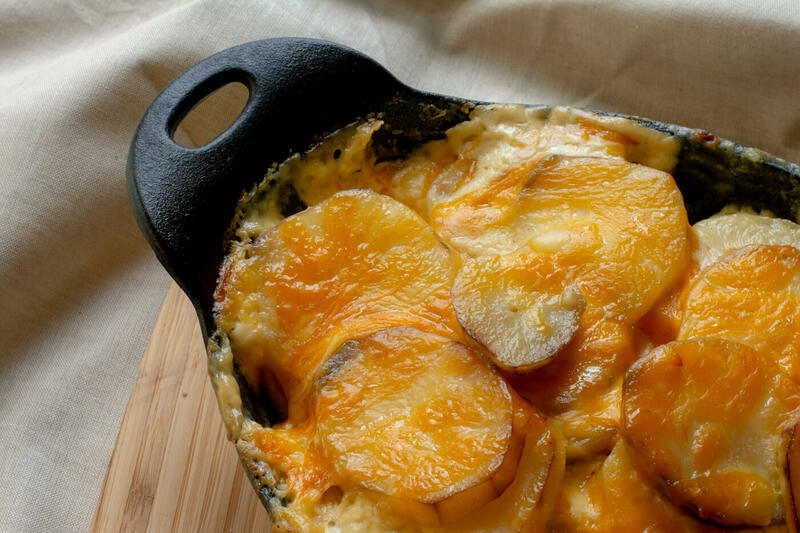 It may taste more like a scalloped potato recipe. Delish, and I love them, but they just aren’t Steakhouse Potatoes. Slice up five russet potatoes. You can use red or baby potatoes but those softer potatoes will take a bit less time to cook. Grate all cheese and combine together. Bring two cups of heavy cream to a boil in a saucepan. Add 1 tsp of onion powder and 1 tsp of garlic powder along with salt and pepper. Stir briskly so as to not burn. Layer in the bottom of a greased cast iron pan with potatoes. Pour about half of the heavy cream on top and add half of the grated cheese. Layer the remaining potatoes, heavy cream and cheese. 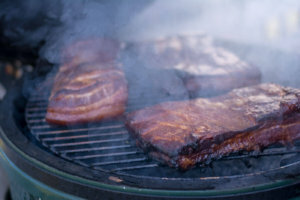 Cover with foil and grill on indirect heat for 30-40 minutes at 350 degrees. 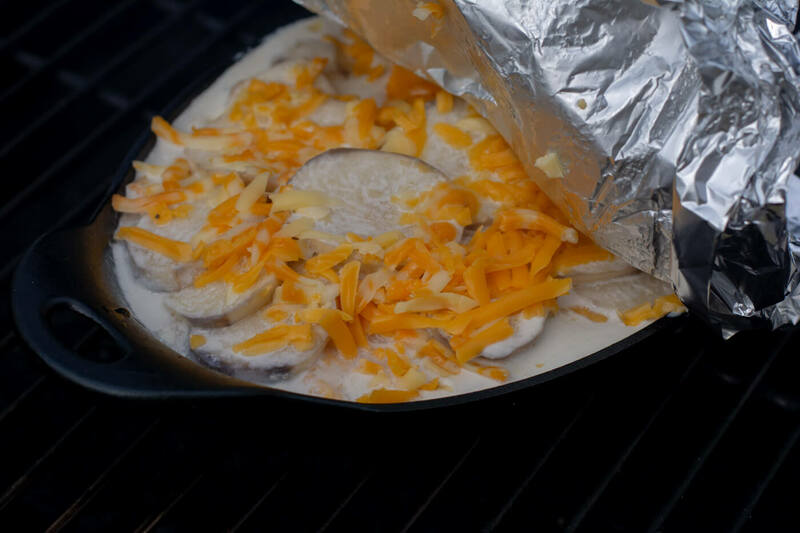 Take the foil off and continue to grill for an additional 30 minutes or until potatoes are fork tender. Let stand for 5 minutes and serve. 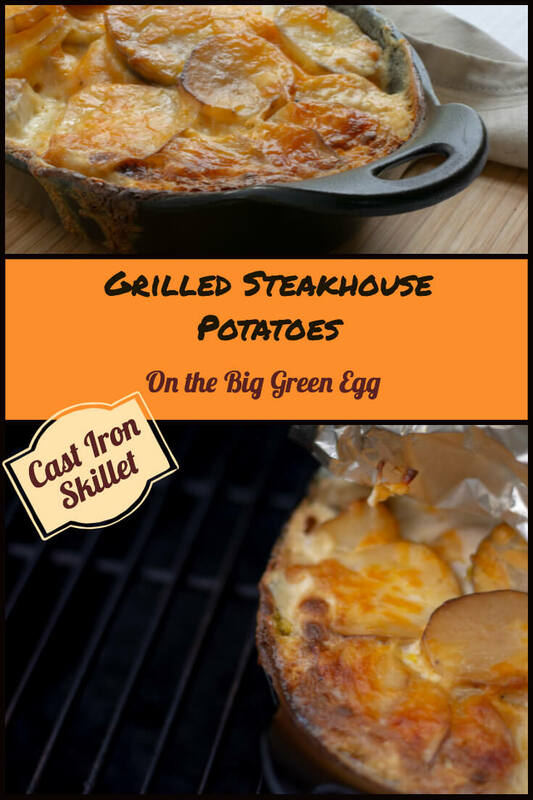 What is Good to Grill with These Steakhouse Potatoes? As long as you are going to cook this dish, grill up a fantastic Herb Butter Ribeye to really take this grilling day over the top! Steakhouse Potatoes with Melted Cheese - Ready to Eat! Slice potatoes. Grate all the cheeses and combine together. Heat heavy cream to boiling. Add onion and garlic powder. Salt and pepper to taste. 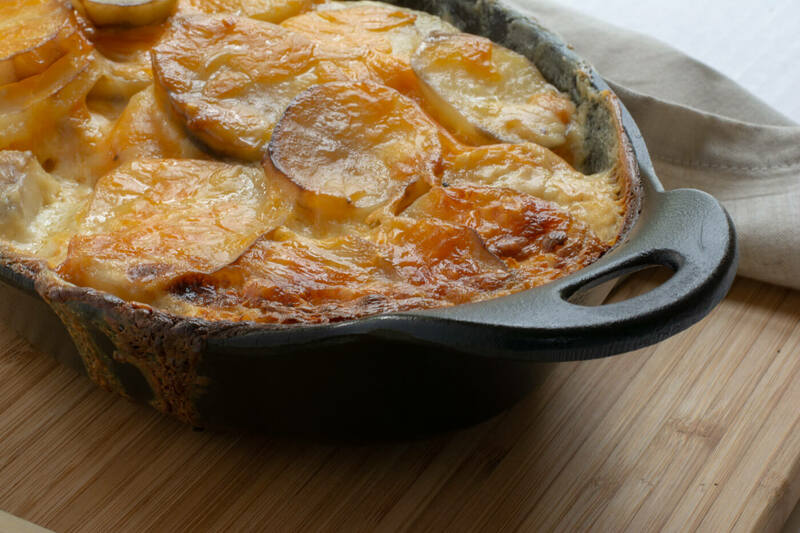 Grease the bottom of a cast iron pan and layer bottom of pan with potatoes. Pour on 1/2 of the heavy cream. Layer on 1/2 of the cheese mixture. Do this one more time. Place foil over the top. Heat grill with indirect hearto 350 degrees and place cast iron on top of grill plate. 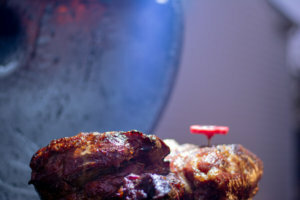 Cook for 30 minutes and then remove foil and cook an additional 30-40 minutes until fork tender. Let sit for 5 minutes before serving. Tried this recipe?Mention @KitchenLaughter or tag #KitchenLaughter!